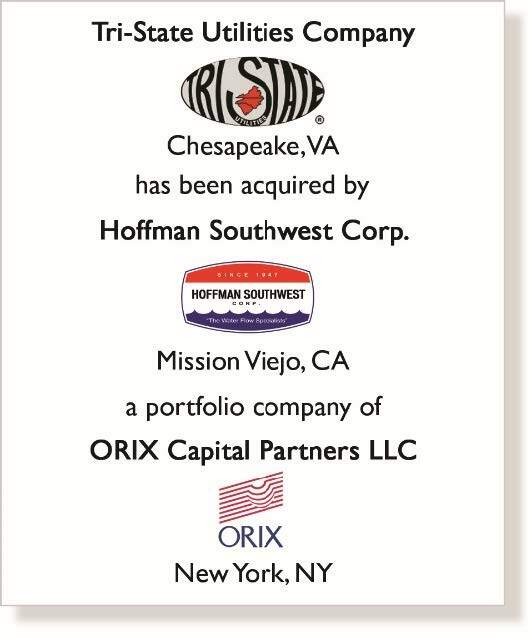 RICHMOND, VA – Matrix Capital Markets Group, Inc. (“Matrix”), a leading, independent investment bank, is pleased to announce the sale of Chesapeake, VA-based Tri-State Utilities Company (the “Company” or “Tri-State”) to Hoffman Southwest Corp. (“HSW”), a portfolio company of ORIX Capital Partners LLC (“ORIX”). Founded in 1990 by Steve McSweeney, Tri-State is a leading, award-winning, regional provider of trenchless repair, rehabilitation, inspection, and other maintenance services to the municipal utility market. After nearly two decades of successfully providing technical services to support the maintenance needs of its customer base, Mr. McSweeney passed leadership of the Company’s operations to his two sons, Andy McSweeney and Joe McSweeney, in 2007. The change in leadership coincided with a period of rapid expansion for Tri-State, as the McSweeney brothers invested heavily in fleet and human capital in order to establish the Company as a market leader in trenchless utility rehabilitation throughout the Mid-Atlantic and Southeast. As a result of those investments, Tri-State maintains long-term sewer and stormwater contracts with an enviable list of blue-chip customers. Additionally, the Company has received recognition from its customers, vendors, and the broader industry for its exceptional safety credentials, technical expertise, increasingly diverse suite of services, and expanding geographic reach. HSW provides underground pipe inspection, trenchless pipe repair, excavation and cleaning services for municipal and utility customers. Troutman Sanders served as legal counsel for Tri-State. About Matrix Capital Markets Group, Inc. 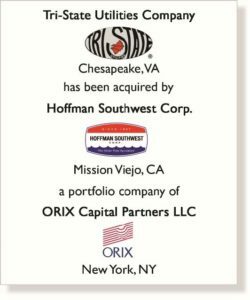 Founded in 1988, Matrix Capital Markets Group, Inc. is an independent, advisory focused, privately-held investment bank headquartered in Richmond, VA, with additional offices in Baltimore, MD, Chicago, IL, and Dallas, TX. Matrix provides merger & acquisition and financial advisory services for privately-held, private-equity owned, and publicly traded companies, including company sales, recapitalizations, corporate carve outs, corporate recovery, management buyouts, capital raises of debt & equity, corporate valuations, fairness opinions and business consulting. Matrix serves clients in a wide range of industries, including downstream energy, convenience retail, industrial products, building products, consumer products and business services. For additional information or to contact their team members, please visit www.matrixcmg.com. Securities offered by MCMG Capital Advisors, Inc., an affiliate of Matrix Capital Markets Group, Inc., Member FINRA & SIPC.